We’re passionate about creating the best experience for you as you celebrate your wedding. Food plays a big part, from exquisite canapes to beautifully prepared delicacies and gastronomic suppers. Our Head Chef delights in creating innovative, exciting dishes sourced from local suppliers who are proud of their provenance. 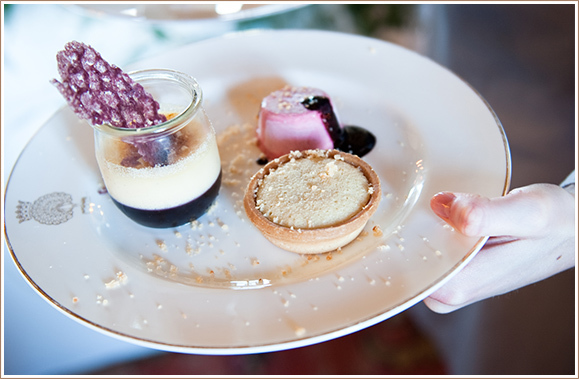 You’ll be able to personalise your menu so that it reflects your special day. For inspiration, take a look at a sample menu here. We’re able to offer suggestions for guests who may have particular dietary needs and we’re more than happy to fit in with any theme that you choose. An absolutely outstanding venue for weddings, with the perfect setting and all of the rooms are just so beautiful. Our wedding co-ordinator and all the lovely members of staff were so friendly, polite, helpful and couldn’t do enough for us to ensure our special day was perfect, relaxed and memorable for not only us but all of our guests. The guided tour for guests and the firing of the canons were a huge highlight for all and the food and service was excellent.